For sample images and information about the collection items, return to the "VFL Manuscripts" tab at the top of this page and choose Western MSS or Non-Western MSS. Our collection of original manuscripts currently numbers 61 separate items, comprising mostly detached leaves, but also counting 3 documents and 8 codices. The total represents manuscripts produced from the thirteenth through the twentieth centuries in Europe, Asia, and the Middle East. These include Bibles, Books of Hours, Missals, Breviaries, Antiphonaries, Saints’ Lives, texts of canon and Roman law, and a number of non-western works such as the Qur'an, Buddhist scriptures, commentaries, and literary works. The collection is available to researchers, students, and faculty, and may be used for course presentations or student research projects. For classroom appointments in the Vatican Film Library, please contact Erica Lauriello, Special Collections department administrator, 314-977-3090. 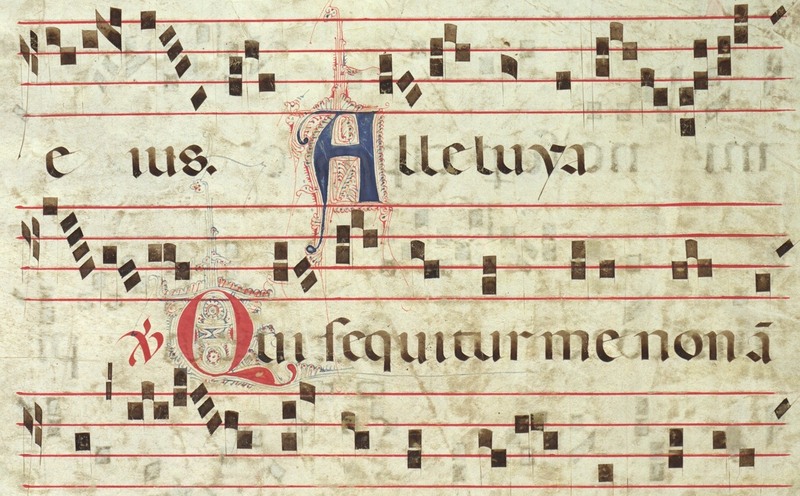 The VFL collection of original manuscripts has been digitized and posted in Digital Scriptorium, a digital union catalog representing a consortium of American libraries with collections of pre-modern manuscripts. To find SLU collections, follow the "Search" link to "Browse by Location," and then scroll alphabetically by city to "St. Louis." In the SLU Libraries Catalog, Search by "Other Call No." and "VFL MS" for the entire list of VFL manuscripts by Shelfmark. To browse the manuscripts by genre of text, return to the "VFL Manuscripts" tab at the top of this page and choose "Western MSS" or "Non-Western Manuscripts." The records and images on these pages all link to the complete records in the SLU Libraries Catalog and to their records in Digital Scriptorium.